Continuing our studies from last quarter, this assignment proves to serve as a catalyst for a preliminary round at the exploration of data visualization. Exemplified within my poster, I have noted issues that were of the respiratory spectrum in relation to the sources that they may derive from. Within the duration of my research, it was discovered that the two main sources of dust (besides the Owens Lake) are caused by a volcanic tabeland and the emissions from off-road activity. The volcanic tableland that became a major contributor was the Bishop Tuff. It is comprised of volcanic ash deposits that remain from the eruption of the Long Valley Caldera and continues to become a detriment to public health within the Owens Valley. 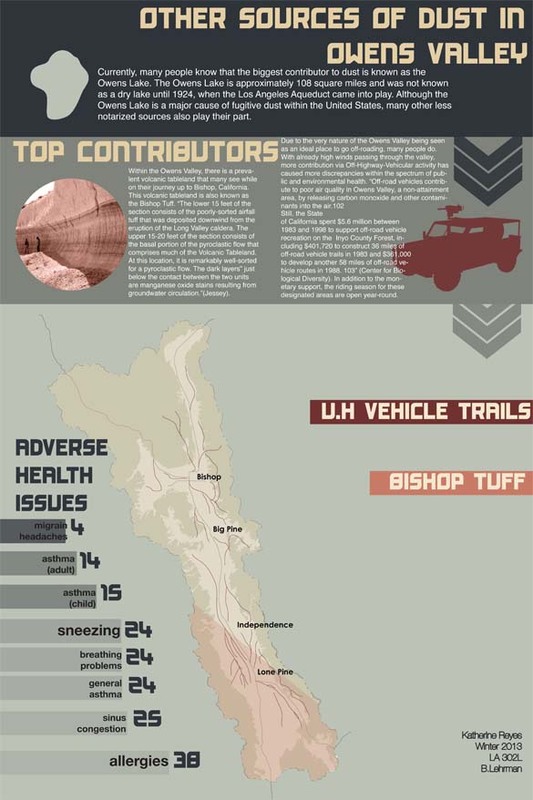 Another correspondent to the rising respiratory health issues is the dust emissions from the fugitive dust of off-roading vehicles. Off-roading remains to be a major subculture within the Owens Valley and many residents with an environmental compass dislike the unrestricted activity that has disrupted their natural ecosystem.